The DDG Board at its meeting in Santo Domingo, Dominican Republic, on February 17, 2014. An album of photographs from this meeting is available here. An album of photographs from the annual convention of the Diocese of the Dominican Republic is available here. The Board of Directors of the Dominican Development Group met on February 17, 2014, in the headquarters building of the Episcopal Diocese of the Dominican Republic in Santo Domingo. 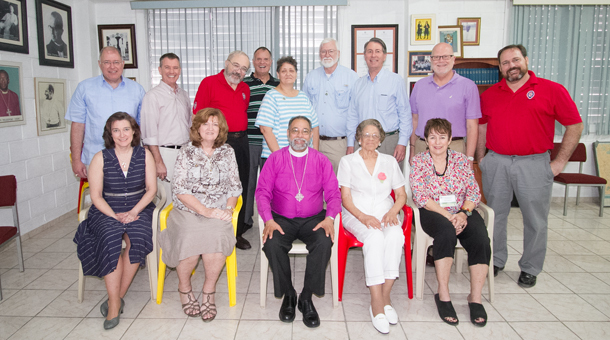 The Board traditionally meets twice each year, once in Santo Domingo immediately following the annual convention of the Episcopal Diocese of the Dominican Republic, and once in one of the DDG’s companion dioceses in the United States. The next meeting will be held on October 27, 2014, in Detriot, Michigan, in conjunction with the annual convention of the Diocese of Michigan. Board members arriving early for the meeting had the opportunity to attend the Dominican diocesan convention which was held on the grounds of the Epiphany Cathedral and the Center for Theological Education in Santo Domingo from Friday – Sunday, February 14-16, 2014. The DDG Board meeting followed the Dominican convention on Monday, February 17th. For more information on this event, contact Bill Kunkle (813-400-2722; bkunkle@dominicandevelopmentgroup.org).